We’ve added a handy new ‘Export as CSV’ feature so you can download your entire Gigs history as a CSV file. 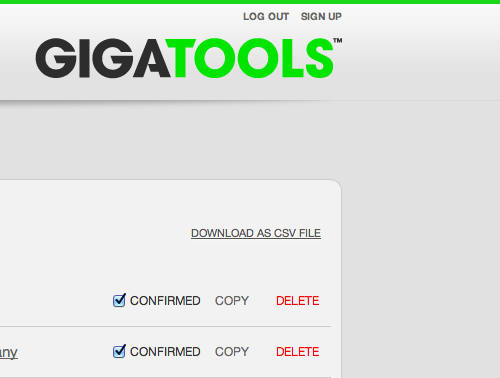 Log into GigaTools and follow the link to MANAGE GIGS and you will see the Export as CSV link. This entry was posted on Thursday, June 27th, 2013 at 1:49 pm and is filed under News. You can follow any responses to this entry through the RSS 2.0 feed. Both comments and pings are currently closed.